It’s fun to uncover little puzzly bits of history, but when history, puzzles, and entertainment intertwine, it always makes for intriguing viewing. 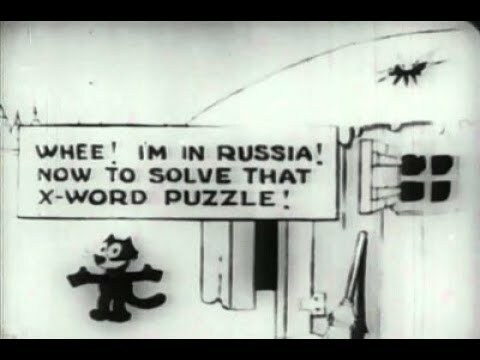 So when friend of the blog Darcy Bearman showed me a Felix the Cat cartoon from the 1920s that centered around an unsolved crossword puzzle, naturally I was intrigued. It wasn’t hard to track down a copy, given how practically everything seems to be on YouTube these days. Originally Released on January 15, 1925. Pondering what the answer could be Felix, the cat laments that he could eat if only he could get to Russia and uncover the missing word. A nearby mule kicks Felix all the way to Russia, seemingly out of spite — clearly a Moscow Mule — and Felix lands in a small hut. Momentarily mistaken for a bomb, he leaves the hut and heads into town. He sees two Russians leaning over some papers, and presumes that the answer will be on those papers. But after sneaking into the building, he’s accused of spying, shot at, and chased out. As it turns out, these two men are plotting a revolution, and they toss bombs at Felix. After avoiding several of them, Felix is blown into the air by the last one, and ends up back in America. His owner, the ungrateful boor, immediately asks if Felix found the answer. He doesn’t ask how his trip was, or if he’s alright, or hey, can I get you a bite to eat after your mule-and-bomb-propelled world tour. What a jerk. And Felix’s snarky reply turns out to be the correct answer. Felix laughs. His owner does a little victory dance. And the cartoon ends. Naturally, I can’t help but ask… DID YOU FEED FELIX NOW THAT YOUR PUZZLE IS DONE, YOU SELFISH DOOFUS? I mean, come on. It’s the whole reason that Felix bothers going to Russia. He wants to eat. Feed him! You may have noticed that the cartoon is a little choppy. If you did, kudos to you. 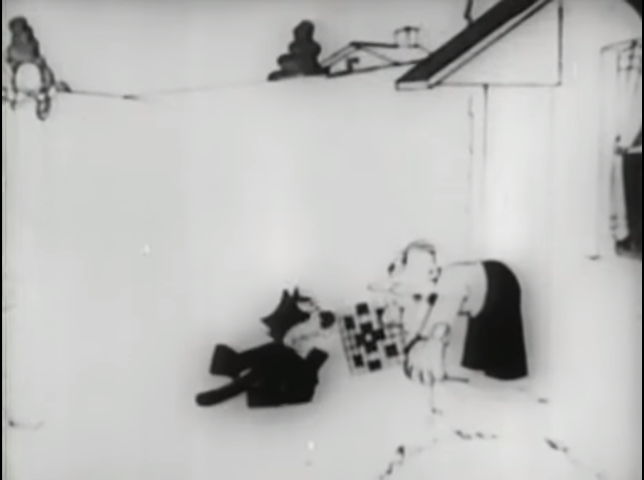 As it turns out, most of the copies of this cartoon that are in circulation are from a Kodascope print where several scenes were cut. Given that the original run time listing was 5 minutes, suddenly the choppiness makes sense. A half-dozen sequences or so are missing from this version, and they explain some of the weirder moments in the cartoon. 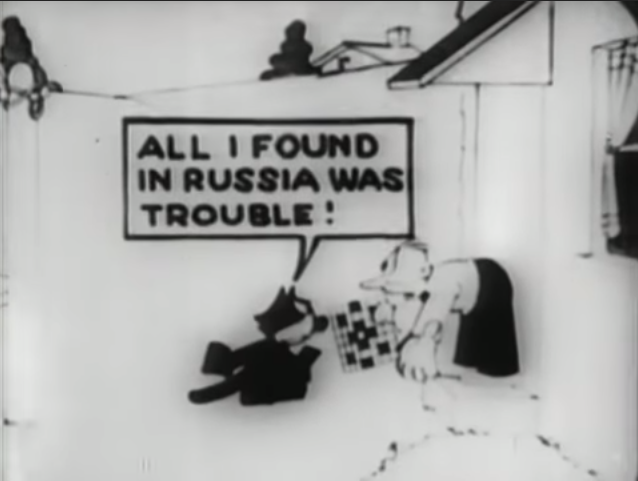 For instance, the mule kicks Felix because the question marks (from his attempts to figure out how to get to Russia) tickle the mule. Now, let’s talk about that puzzle. TRIPPLE is a pretty strange 1-Across. A chiefly South African term for a horse’s gait (according to Merriam Webster, anyway), you can’t help but wonder if they simply misspelled TRIPLE. The only other entry that jumps out at me is NVA, but only because I wonder how it would be clued. It’s not like a 1925 cartoon would be referencing the North Vietnamese Army. Upon further digging, I suspect this would have been clued referencing the National Vaudeville Artists, a union formed by Edward Franklin Albee. 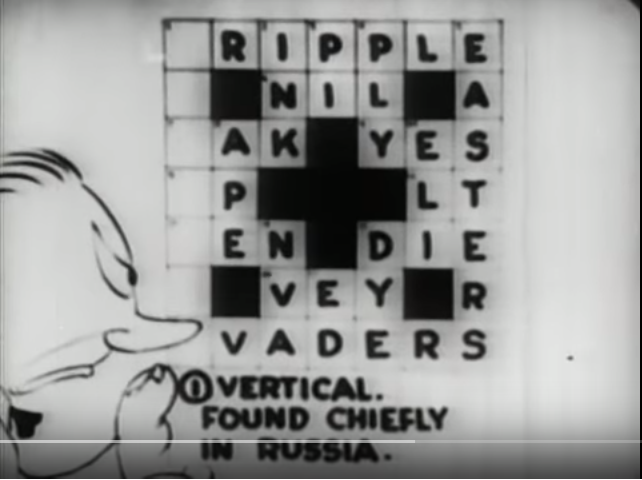 The clue “Theatrical organization” is used for NVA in a 1953 New York Times puzzle, according to XwordInfo. 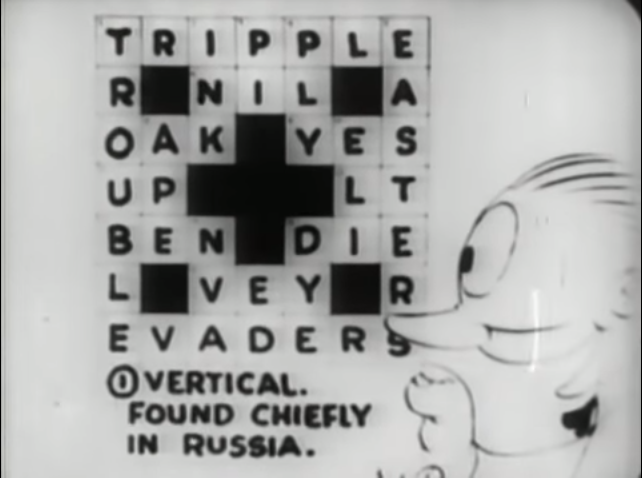 Of course, with obtuse cluing like “Chiefly found in Russia,” even a small grid like this could prove to be a challenge! 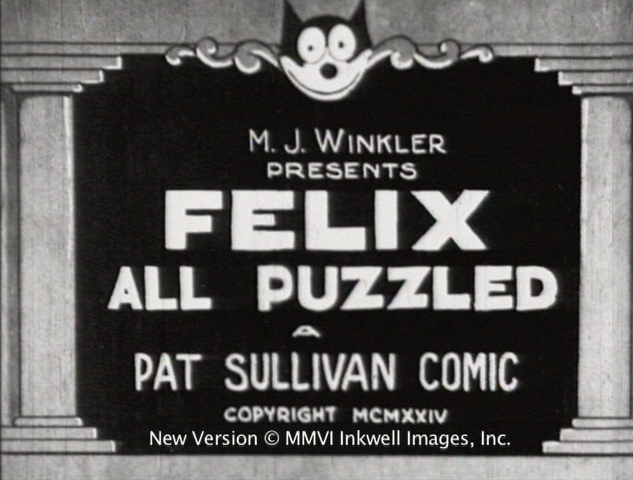 This entry was posted in Games, PuzzleNation, Puzzles and tagged Cluing, crossword, crosswords, edward franklin albee, felix all puzzled, felix the cat, Geeking Out, kodascope, m.j. winkler, mj winkler, national vaudeville artists, New York Times, New York Times Crossword, nva, otto messmer, pat sullivan, Pop culture, Puzzle to solve, PuzzleNation, Puzzles in Pop Culture, Puzzlin' fool, russia, Wordplay, XWord Info, XWordInfo, XWordInfo.com by gmdirect. Bookmark the permalink.